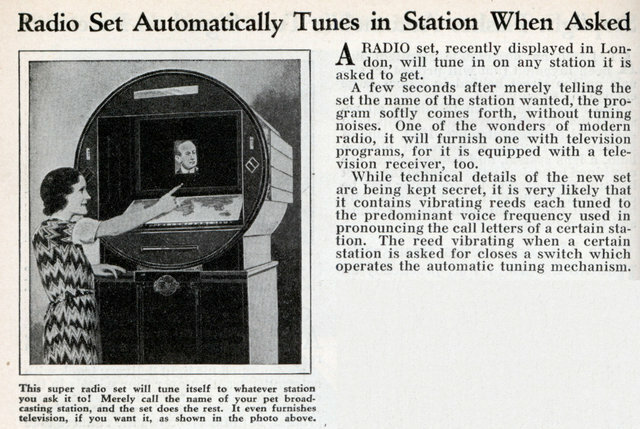 A RADIO set, recently displayed in London, will tune in on any station it is asked to get. A few seconds after merely telling the set the name of the station wanted, the program softly comes forth, without tuning noises. One of the wonders of modern radio, it will furnish one with television programs, for it is equipped with a television receiver, too. While technical details of the new set are being kept secret, it is very likely that it contains vibrating reeds each tuned to the predominant voice frequency used in pronouncing the call letters of a certain station. The reed vibrating when a certain station is asked for closes a switch which operates the automatic tuning mechanism. If you just need a few words, it could be done rather simply like it’s mentioned in the article. Though a series of vibrating reeds is a neat way to do a fourier transform in hardware! It’s so compact…… why it would hardly be noticeable in any room of the house! Is the man in the box included in the product or do you have to furnish your own? Introducing the Radio of the Future: a radio with a TV set attached! I have to strongly suspect a hoax, too. My car now does this. I push a button and say “Radio 90.7 FM” or “Radio 1610 AM” and it will use its own voice to announce what it heard me say, and then set the radio. The voice recognition can also do other things, like setting the climate control and operating the GPS. But even with today’s technology, it doesn’t know how to tune to a station given the station’s name or call letters. I have to say the frequency. 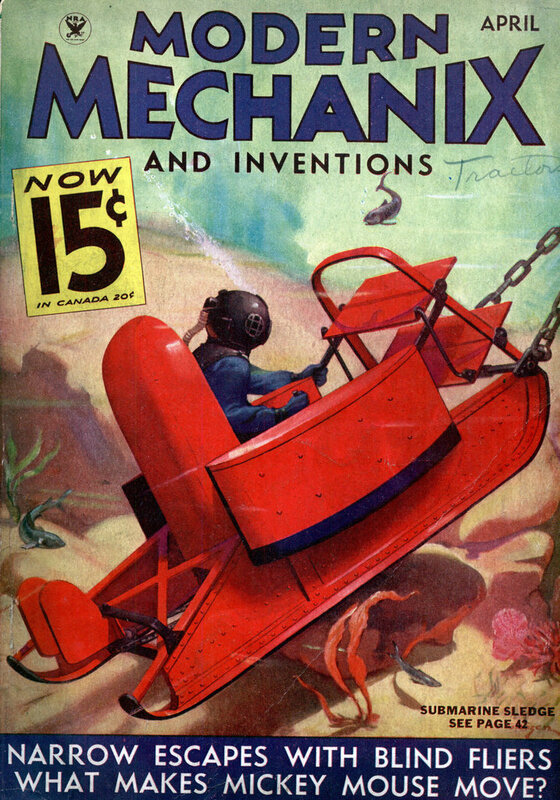 Granted, the name lookup wouldn’t be so hard in principle, but would require at least a database that would be impractical in 1930s technology. Furthermore, I have to push a button before I speak to it. When I push the button, it mutes the radio’s speakers so it can hear me better. I have to speak clearly, and if others in the car are talking, it can get wildly confused. This article doesn’t mention any such issues. If radio station WABC happened to play music that activated the reeds used in WNBC, would the radio re-tune itself? My modern computerized system has voice recognition that’s a LOT more sophisticated than a few vibrating reeds, yet its still only barely useful. While it can theoretically control a lot of the navigation, climate control, and audio systems, I find that, for most functions, the conventional old buttons are usually faster and less distracting to use while driving. But tuning the radio to a specific frequency that’s not already on one of my presets (say, a station I notice on a road sign when I’m away from my home area) is one area where it actually is useful. My car with voice recognition is a 2007 Honda Odyssey with navigation, BTW. I am more inclined to think that it only tuned the few stations available. Notice that the article says ‘London’ as the location – don’t they only have BBC 1 – 3 or 4? heck, how many did they have then?